The issue of terrorist attack has been a great concern and very problematic not only for UK but to the entire world. A quick reflection on the UK terrorist attack that happened on the 22nd March 2017. To encourage peace and promote religious harmony in our community , hence NASFAT Peace Walk. We want to stage a Peaceful walk involving all faiths to demonstrate and make public pronouncement that such an act should not be condoned in any form or shape. We are now calling on you and your colleagues; Muslims, Christians, Hindu, Sikh and all other faiths to please support and embrace this initiative tagged "NASFAT Peace Walk 2017" to make it a success, as we would continue to build a positive, fear free, peaceful and united society together. To raise money for the organisation to ensure continuity and execute other programmes. •	Promote religious tolerance and peaceful coexistence •	Promote diversity; getting you more closely to the people you are serving. •	To eradicate the notion that Muslims are violent. •	To create awareness and show our concern on terrorist attacks. •	To stand united in the struggle against terrorism and extremism. •	To commemorate and remain united after the roses had withered. •	To encourage peace and promote religious harmony in our community. 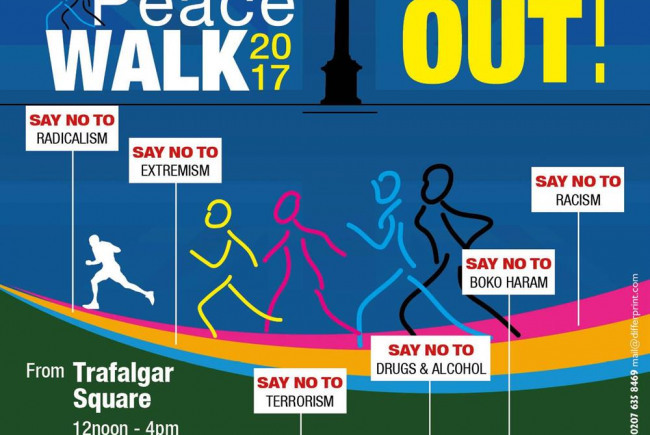 The Nasrul-Lahi-L-Faith Society of Nigeria would like to seek your permission to use Trafalgar Square a starting point and destination point for it’s project tagged “Peace Walk 2017” on Sat 8th July 2017 from 12pm to 4pm or any alternative Saturday to be advised. The Nasrul-Lahi-L-Faith Society of Nigeria is a worldwide Muslim Society currently having 355 branches, spread over all continents of the world. A group of Muslim professionals founded the Muslim Society in 1995 in Nigeria. The world headquarters of Nasrul-Lahi-L-Faith Society of Nigeria is situated at 6 Adebo Close, Ilupeju, Lagos, Nigeria. The Zonal Executive Council is the administrative hub of all the affiliated branches and groups of the Nasrul-Lahi-L-Faith Society of Nigeria in the United Kingdom and is situated at No. 33 Pages Walk, London SE1 4SB with branches of the society spread across United Kingdom. Project Delivery Manager: NASFAT UK&IRELAND The Project Delivery Manager takes legal responsibility for receiving and spending the funds raised and ensuring the project is delivered.